Rotary Optical Encoder has brushless commutation outputs. Multi-Turn Rotary Encoder features 36-bit resolution. Accu-Coder(TM) Model 225 can be used in applications that previously incorporated tachometers and similar devices. It is available in bore sizes up to 7/8 in., and comes with variety of connector options, including the Turck Eurofast(R), and with encoder electronics. Optical Encoders suit tight package constraint applications. 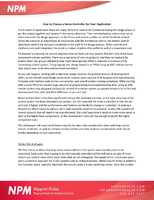 Rotary Encoder suits tight constraint applications. Rotary Encoders are rated for temperatures to 239 deg F.
Hollow Shaft Encoder has installed length of 2 in. Built around HS35 incremental design, HS35 12-bit absolute hollow shaft encoder is available in through and blind-shaft versions, variety of shaft bores up to 1 in. dia, and with 2 tether options. It carries IP65 environmental rating and operates from 0 to 70Ã‚° C with extended operation to 85Ã‚° C. Encoder is suitable for installations that have limited axial shaft space. 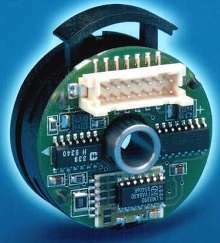 Rotary Encoders provide alternative to resolvers. 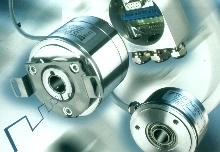 Rotary Encoders are available in singleturn version, ECI 1317 which counts 17 bits, 131,072 measuring steps per revolution; and multiturn EQI 1329 with 4096 distinguishable revolutions (12 bits). Units feature inductive scanning principle and EnDat interface. 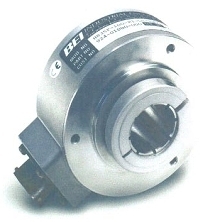 They are designed for servomotor and general applications. 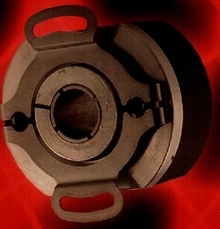 Hollow-Shaft Encoders are intrinsically safe. 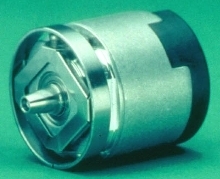 Encoder is available in thru-bore and hollow shaft.